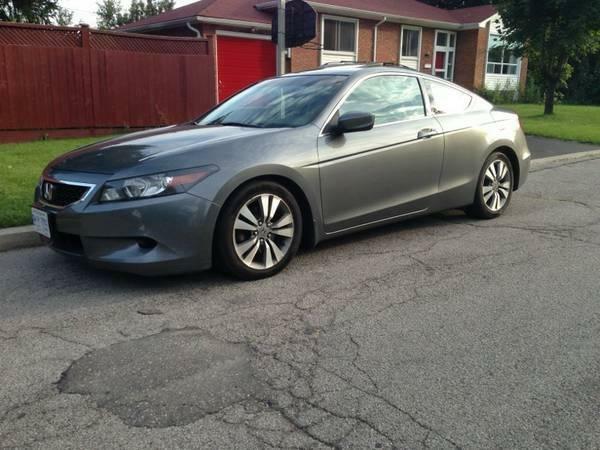 I'm selling my xxxx Honda Accord Coupe. 126xxx km It has heated leather seats, navigation, cruise control, sunroof, telescopic steering, 17" alloy rims. Lowered on Eibach springs 1.25" which could be put back to stock height or I will provide the stock springs. Also have a 10" Mtx subwoofer with a bassworx box hooked up to the factory sub. Factory sub can be reconnected. You can take over my finance for $318 a month or purchase for $14,800. Benefit of taking over the finance is you save on the taxes!